Comments: Broadleaf evergreen native to New South Wales in Australia. Juvenile leaves are oval to ovate, oposite and glaucose to the point of being blue-white, adult leaves are lanceolate, oposite to disjunct, concolorous and also whitely glaucose. 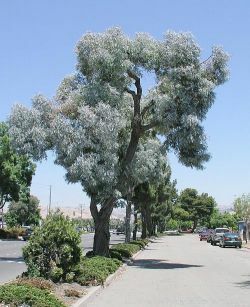 Bark is gray, stringy and persistant on the trunk, and branches. Height to 80' but locally much shorter. Tentatively identified as E. cinerea.